"A long drive through the desert, in a bus." 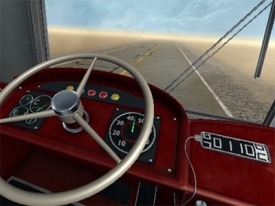 A virtual yet very real bus driving simulation, please note this download is the VR version and functions much better if you have an Oculus VR headset as if you don’t it looks quite strange and can make you go a little cross eyed! Well Desert Bus, what is there to say about Desert Bus, if you hadn’t guessed you drive a bus…in the desert, well actually you drive a bus from Tucson Arizona to Las Vegas Nevada an 8 hour drive at 45 mph and as your bus is restricted to 45 mph it’s going to take you 8 hours, it’s like the polar opposite of the film Speed, the bus has no passengers the scenery barely changes and there is definitely no bomb on the bus. However this game is a cult classic, make sure you have gone to the toilet before you start, have your drinks and snacks within arms reach whilst you’re playing because once you start there is no pausing this game, it’s just you, a bus and the open road for 8 whole hours and what happens after 8 hours you ask, well you can then drive the bus back another grueling 8 hours to Tucson. Those of you old enough to remember Penn and Teller may or may not be surprised it was them who created Desert Bus for the Sega CD (one of a few games that was to be included in the never released Penn and Tellers Smoke and Mirrors) when the critics were up in arms about video games promoting violence (is there a time that they weren’t?) so this game was designed as a game that represents reality, literally 8 hours driving a bus, the bus also veers slightly to one side so you cannot just leave it on “cruise control” and go and relax, you must do the whole 8 hours, THE WHOLE 8 HOURS!!! The game is ironic and whilst I enjoy a little satire I don’t particularly want to drive a bus through the desert for 8 hours, but if you do be my guest, go ahead and download it free here.